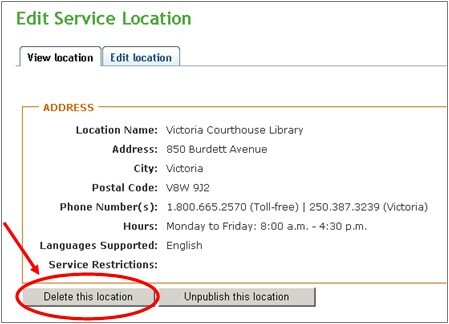 You may want to delete an individual location, for example when your service remains the same but a location is closed. To delete a location, click Delete under Actions. Alternatively, you can click View/Edit to view the resource, and click on the Delete this location button at the bottom. 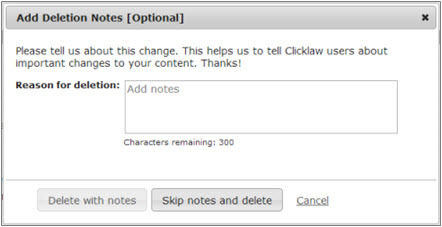 You will see a dialogue box asking you to send notes to Clicklaw Editors. Explain why the location will be deleted and then click Delete. This helps Clicklaw Editors stay better connected to what is happening with your services. If you change your mind, you could still click Cancel and your resource will not be deleted. This page was last edited on 27 August 2014, at 11:28.